HMS Victory HMS Victory, the most famous ship in the history of the Royal Navy, is best known as Horatio Nelson's flagship at the Battle of Trafalgar on 21 October 1805. Today Victory is docked at Portsmouth and as flagship of the Second Sea Lord and Commander-in-Chief Naval Home Command is the oldest commissioned warship in the world. In March 1805 Villeneuve's fleet slipped out of harbour and Nelson chased it to the West Indies and back without meeting it in battle. The French ended up being bottled up in Cadiz harbour in Spain and when they set sail for the Mediterranean on 19 October Nelson aboard Victory was waiting. On 21 October 1805, Victory led the British fleet into battle off Cape Trafalgar against the Franco-Spanish force; at 1148 the most famous signal in the history of the Royal Navy, 'England Expects That Every Man Will Do His Duty' flew from her masthead. After further service in the Baltic and off the coast of Spain, Victory was put into reserve in 1812 in Portsmouth. Flagship of the Port Admiral from 1824 she became flagship of the Commander-in-Chief in 1889. She entered her present dock in Portsmouth on 12 January 1922. Notes: The carronade was a short heavy gun which fired a large quantity of shot at short ranges. At Trafalgar Victory's carronades were loaded with a 68 pound ball and 500 musket balls which were fired with devastating effect into the stern of the French flagship Bucentaure. 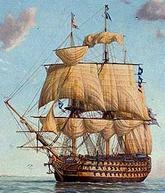 See News for articles on HMS Victory.